So Chiang Mai lost the Lanna derby 0-1 at home to Chiang Rai United last night but the result is less significant than what was going on behind the scenes leading to the management, team and supporters being cheated by the owners and directors of the club. Boon Rawd brewery (Singha and Leo) own Chiang Rai United, Chiang Mai FC and also Bangkok Glass. Chiang Rai United is the senior team and has a squad far larger than needed. Some ten players are out on loan – mostly to Chiang Mai FC. In most leagues players on loan to another club cannot play against the club that they are contracted to. The Thai league allows loan players to play against their owner club unless the owning club says otherwise. Chiang Rai should be a contender for the league title but their start to the season has been difficult. Three days before last night’s game Chiang Rai said that most of the on loan players would not be allowed to play for Chiang Mai. Midfield: Chotipat; Ekanit and Gionata. Azadzoy is an ex-Chiang Rai player – he was on loan to Chiang Mai last season but I thought that he was now contracted to Chiang Mai. Which makes his omission strange. Oddly Yuttajak was allowed to pay and on the substitute’s bench was Kevin, a goalkeeper. Both are contracted to Chiang Rai. Kevin came on as early as the 12th minute after a hand or wrist injury to Narit. Chiang Rai’s decision to forbid the use of loan players by Chiang Mai led to the resignation this week of the Chiang Rai club chairman/president. The rest of the club’s board of directors are Boon Rawd company officers. It was 38C at kick off. The AQI was around 170. Basically a miserable night for football. And that was reflected in the pace – or lack of it in the game. It did not look as through Chiang Rai ever got past second, maybe third gear. Chiang Rai had a goal disallowed just before half time; Shinnaphat ruled offside. In the 51st minute Siwakorn made it 1-0 to Chiang Rai with a direct run and finish from 20 yards low to Kevin’s right side in the Chiang Rai goal. Evson, who was generally strong all game, will look at that goal and think his challenge should have been stronger. Kevin then made a fabulous save from a Bill header after a cross from Lee Yong-Ra. The ball deflecting against the crossbar and down onto the goal-line – credit here to the linesman who was right in line and said no goal. 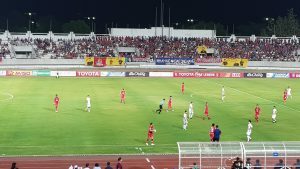 Up front Chiang Mai offered little – Ronnachai shot just wide after 9 minutes and in the 37th minute a strong break from Eviason finished with him blazing narrowly over the crossbar. In the last fifteen minutes both Evson and Thossapol went down with severe cramp. Evson was eventually substituted. That in itself tells you where the game was being played. The only surprise was that Chiang Rai did not finish the game off. At 0-1 down Chiang Mai always had a chance of salvaging an unlikely point. Chiang Rai were poor. But they had the advantage of playing against a Chiang Mai side that was playing with its hands tied. There is something genuinely unsavoury about this match; about how it was won; and what it says about the owner’s commitment to Chiang Mai FC. The Boon Rawd brewery will ensure (as far as it can) that Chiang Rai is competing for honours this season. It has offloaded surplus footballers to Chiang Mai – but then decides when they are allowed to play. To make this decision just three days before the game is not in the spirit of the sport or of co-operation between the clubs. It also short changes the fans who want to see the best players and a competitive match. This is not a situation that will be resolved until and if Chiang Mai is independently owned. If that does not happen (and it is hard to see any independent corporation with deep enough pockets to finance this club) then Boon Rawd will make the decisions for the club and the management. Leaving Chiang Mai in danger of immediate relegation – probably to be replaced by Boon Rawd owned Bangkok Glass. The club coach will make the right PR noises about moving onto the next game; but he has always appeared to be the most genuine and committed of individuals and he must feel that he has been under cut by this farce (there is no better word). Will he stay when he cannot pick his own team? How and if the club bounce back at Chonburi next week will be a big test.